The gallery on the Nokia Asha 503 has two tabs - the all captured tab, which holds all the images and videos you've captured with the Asha 503 and the folder view, which gives you the captured, favorites, modified and received. The Nokia Asha 503's music player has a neat interface and starts up with album art on top of the available sorting options: songs, artists, albums and playlists. There's no folder view and no additional settings for sound, such as an equalizer. The Asha 503 is capable of playing 3GP/MP4/Xvid/DivX videos up to VGA resolution, but you can experience some hiccups with the audio if the bitrate is higher than the phone can handle. 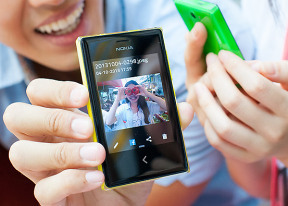 The FM radio on Nokia Asha 503 comes with a neat and simple interface. You can change stations with the dedicated controls on both sides of the centered tool for manual station tuning. With no resistance applied to its line-out (when used with an active external amplifier), the Nokia Asha 503 does decently well, achieving very good scores and garnishing them with high volume levels. 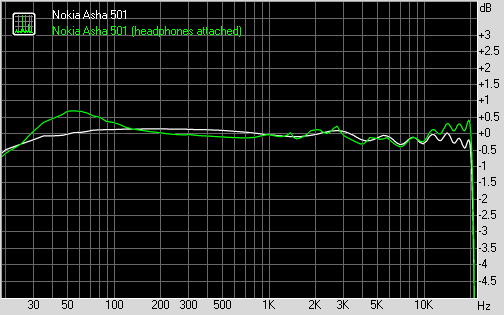 Plugging in a pair of headphones leads to spikes in intermodulation distortion and stereo crosstalk as well as a rather big drop in volume levels. Overall, the Asha 503 retains its output better than its Asha 501 sibling, though and while it's certainly not the most talented portable music player around, it does as well as you could expect given its modest price tag.